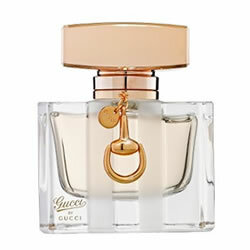 A scent of defiance, the wearer of Gucci Guilty is the architect of her own destiny. This warm yet striking oriental floral scent carries hedonism at its heart, and seizes the attention with a flamboyant opening born of the natural rush that is mandarin, shimmering alongside an audacious scattering of pink pepper. The scent now appears in a new limited edition flacon adorned with more than 400 studs per bottle; exclusive collectorsÕ items for iconoclasts everywhere.